LOS ANGELES, CA--(Marketwired - Mar 11, 2015) - IHRSA Booth #1444 - Life Fitness, the global leader in commercial fitness equipment manufacturing, is introducing the Life Fitness Row GX™ Trainer, a rowing machine that gives exercisers the feeling of a natural rowing motion for a challenging full-body workout, at IHRSA 2015. 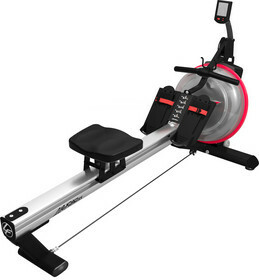 As gym owners look for creative ways to provide new programs for their members and incorporate rowers to address the machine's spike in popularity, the Row GX Trainer offers a wide range of applications, including small group training, and is an effective workout for a multitude of users and experience levels. "The Life Fitness Row GX Trainer is for facilities that want to add a whole-body cardio option for exercisers, enhance small group training or create dynamic high-intensity interval training (HIIT) spaces," said Chris Clawson, president of Life Fitness. "Its water resistance feature provides the natural feel that Life Fitness products are known for, and its adjustable resistance settings make it accessible for all fitness levels." Designed with a state-of-the-art, patented Fluid Technology Resistance system, the Row GX Trainer creates a smooth and natural motion that challenges the entire body and delivers one of the most effective workouts available. Its unique design allows each user to feel, hear and see water churn in the tank, creating an engaging rowing experience, and its adjustable resistance design lets the machine adapt to their individual fitness level. This adaptability allows the Row GX Trainer to complement the assortment of programming options facilities are offering exercisers. For instance, in small group training sessions, the Row GX Trainer creates a space for exercisers to engage in a challenging full-body workout. In addition, the portable design makes it easy for the rower to be repositioned throughout the facility for individual workouts, or small group training sessions. The Row GX Trainer can also be stored vertically when not in use to create more floor space in training areas. The Row GX Trainer joins the Lifecycle GX and SYNRGY360 as another dynamic product that expands the Life Fitness small group training offering and provides variety for facilities. By incorporating these products into a space, owners can create fun and energetic individual and group training programs that engage their members and ultimately increase their bottom line. "The addition of the Row GX Trainer strengthens our product lineup even further, and provide facilities with a versatile option to keep their members engaged in popular fitness trends," said Clawson. Available to order in Q2 2015, the Row GX Trainer will be featured at IHRSA, March 11-13, 2015, at the Life Fitness booth 1444. For more information about the show, visit www.lifefitness.com/inspiration. For more information on Life Fitness, visit www.LifeFitness.com.